Muntplein is one of those places you will often pass through during your stay in Amsterdam — either on foot or by tram. Trams 4, 14, and 24, as well as Metro line 52 have nearby stops at Rokin, just a 4 minute walk from Muntplein. Tram 24 also has a stop at Vijzelstraat, 1 minute from the square. Walking from Central Station you can reach the square in about 20-30 minutes. De Munt is part of the so-called Rode Loper — the Red Carpet designed to ‘guide’ tourists deeper into Amsterdam. While Muntplein is a bustling intersection of six streets, nowadays it is used primarily by bicyclists and pedestrians. The introduction of the Noord/Zuidlijn (metro 52), also resulted in a reduction of the number of trams crossing Muntplein from six to three lines. Still, De Munt is not the type of square where you sit down at a terrace and enjoy the scenery. Amsterdammers often use the bridge next to the tower as a place to meet up with friends. Muntplein is a central location from which to explore Kalverstraat — the busy, pedestrians-only shopping street that runs from here to Dam Square. Tourists flocks to the square because the famous floating Flower Market at Singel canal is just across the bridge. Since the 19th century the bridge underneath the square has been widened several times. Officially named Muntsluis (the terms sluice and bridge were used interchangeably) it is now the widest bridge of Amsterdam. By the way, the city has numbered all of its 1281 bridges. The Muntsluis bridge, across the point where the river Amstel flows into the Singel canal, is bridge number 1. The square is overlooked by five-star Hotel de L’Europe as well as the NH Carlton hotel. Hotel de L’Europe was a gift from beer magnate (and Amsterdammer) Freddy Heineken to his wife. It is now owned by his daughter, Charlene de Carvalho. Tramlines 4, 14, and 24 stop close to de Munt. So does metro line 52. Tram 24 stops closest to the square, at a stop named ‘Muntplein.’ It’s a 12-minute ride. This is also where you debark if you want to visit the floating Flower Market at Singel canal. This is also a good place to start your walk through Kalverstraat, the busy shopping street between de Munt and Dam square. Alternatively you can elect to walk along the river Amstel. And while you can take Tram 9 or 14 all the way to the popular Waterlooplein flea market, it is more enjoyable to get off the tram at de Munt, then take the Nieuwe Doelenstraat (to the left of Hotel L’Europe) and Staalstraat. Trams 4, 9 and 14 continue through Reguliersbreestraat to Rembrandtplein, but you may elect to walk through this narrow street to get some fast food, wonder why there are so many Argentinean Steak Restaurants, or take a look at the iconic Tuschinsky cinema. The Vijzelstraat is somewhat of a mixed bag with more or less picturesque (or simply run-down) old shops on one side, and mostly huge, more or less ugly buildings on the other side. Since Muntplein isn’t a sit-down-and-relax kind of square there isn’t much on offer in terms of restaurants or café’s. You can get a bite to eat at Maoz (famous for its falafels, and serving decent French fries as well), MacDonald’s (nah…) or at Il Girasol — an Italian-style eatery and coffee house on the ground floor of the Carlton Hotel (with coffee recommended by the Dutch Amsterdam folks). If you’re on any kind of budget at all — or simply don’t enjoy paying exorbitant prices for drinks or snacks — avoid the kiosk on the bridge nearest to the tower. If you absolutely need to eat or drink something on the go, pop into the Reguliersbreestraat. Halfway down the street is a convenience store operated by the Albert Heijn supermarket chain. Not the cheapest either, but certainly less expensive than the kiosk. Impromptu Terrace Tip: Just off Muntplein, right across from the tram stop and across the Rokin canal, there is a long jetty. Part of it is used by the glass-topped tour boats, but Amsterdammers and tourists alike use the other part as an impromptu picnic spot. Note: if you don’t stop at the Kwekkeboom bakery, further down the same street, to sample some pastries or ‘kroketten’ you haven’t visited Amsterdam. Just inside Kalverstraat you’ll find La Place, a bistro-type restaurant with decent food at decent prices. Our only beef is that hot food tends to be not-so-hot once you made it past the register and found yourself a place in the three-story restaurant. Originally the tower, Munttoren, was part of of the Regulierspoort — one of the main gates in the defense wall around medieval Amsterdam. Built in the years 1480-1487, the gate consisted of two towers and a guard house. In 1618 much of the gate was destroyed in a fire that left only the guardhouse and part of the western tower standing. After the city’s expansion, in 1585, the gate and defense wall had already lost its function, and it was decided to only rebuilt the Western tower. During the rebuilding project (1619-1620) the tower gained its spire, designed by the famous Dutch architect Hendrick de Keyser. 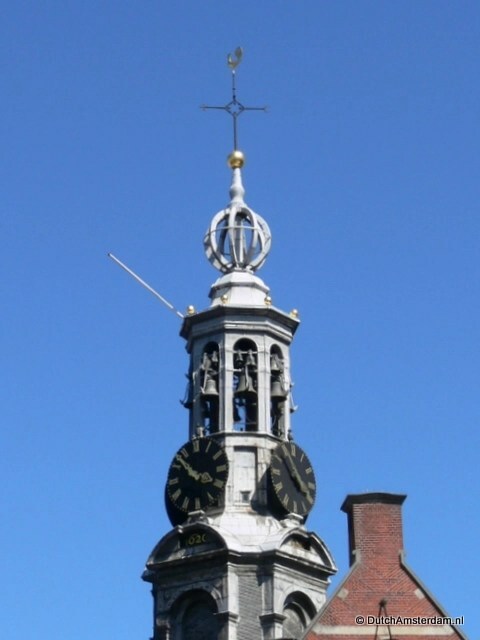 It features a clockwork with four clockfaces, as well as a carillon made by Pieter Hemony. Incidentally, like most towers in Amsterdam the spire is constructed of lead-clad wood with an eye toward the sandy soil on which much of Amsterdam is built. Until 1877 Muntplein was known as Schapenplein — Sheep’s square, likely in reference to a market once held here. 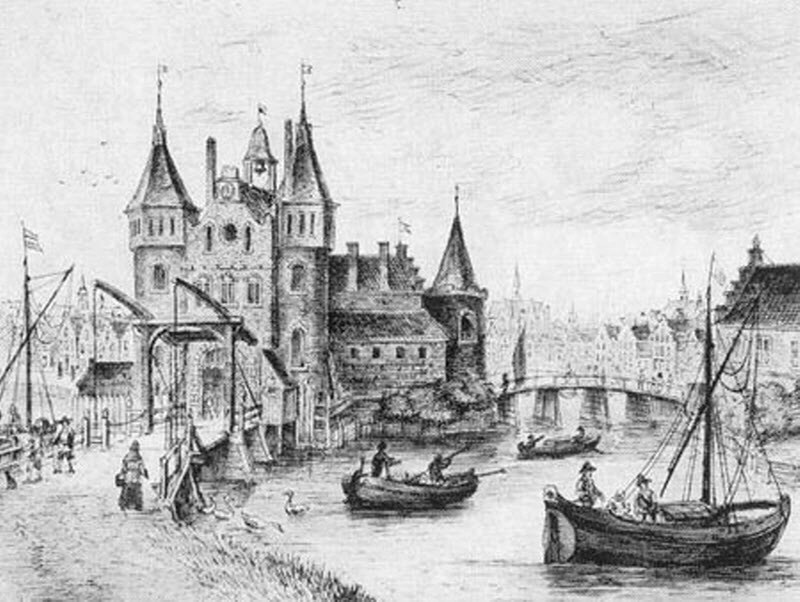 Remember, the river Amstel connected the bustling trade city of Amsterdam with — among other things — the farmers’ land, so this would have been an excellent spot to buy and sell sheep. Likewise the name Kalverstraat, the shopping street which runs into Muntplein, is a reminder of the calf market that used to be at Dam Square — at the other end of the street. And the area between Spui — halfway back to Dam Square — and Muntplein was from 1486 through 1629 used as a general cattle market. In 1672 a large part of the Dutch Republic was occupied by French troops. During this turbulent time silver and gold could not be safely transported to Dordrecht and Enkhuizen — where coins were normally minted. For that reason its was decided that Amsterdam should have its own mint. It wasn’t until 1917 that the name Muntplein became official. Incidentally, the passageway between the tower and the guardhouse was added during a renovation project in 1938 when the bridge was, once again, widened. Try and photograph the Munttoren (the tower) early on a sunny day. For an unusual perspective capture the tower while standing on nearby Rembrandplein or on the Halvemaanbrug the first bridge you see when you walk along the Amstel. The bridge nearest to the tower is a good spot from which to photograph people, as is the area just in front of the entrance of the Kalverstraat. Find a spot next to the tower and overlooking the square — or on the bridge across from Hotel de L’Europe — to film an never-ending stream of bicycles. Record the carillon while filming the tower and square. The bells of the Munt Tower chime every 15 minutes, and the carillon is played each Friday between 15:00 and 16:00 (that’s 3pm – 4pm). Book a hotel near Muntplein and Munttoren.